CHICAGO, IL--(Marketwire - July 17, 2008) - M. Patrick Lowe, MD, renowned robotic surgeon and gynecologic oncologist at Northwestern Memorial Hospital, will demonstrate the use of robotic surgery to treat endometrial cancer via a live interactive webcast on www.or-live.com Thursday, July 17 at 3:00 p.m. CDT. Dr. Lowe, director of the robotics and minimally invasive surgical program for the Division of Gynecologic Oncology at Northwestern University's Feinberg School of Medicine, was among the early adopters of robotics to treat gynecologic malignancies, citing precision, improved dexterity and superior patient outcomes among the benefits. "Women diagnosed with a gynecologic malignancy want the shortest route leading back to a degree of normalcy post treatment," says Lowe. "Robotic surgery offers the path of least resistance, combining shorter recovery times with superior outcomes." Northwestern Memorial is home to the only dedicated surgical robotics program for gynecologic malignancies in Illinois, and one of only a few in the country. 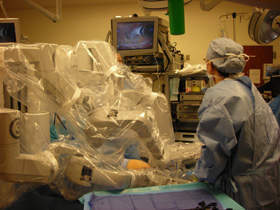 Lowe has been using robotics for gynecology patients since 2006, shortly after it was approved for use by the Food and Drug Administration, and treats an estimated 50 percent of all endometrial cancer patients and 60 percent of all cervical cancer patients using minimally invasive robotic surgery. When compared to traditional surgery, studies have demonstrated that minimally invasive procedures for the treatment of endometrial cancer offer patients similar survival with the added benefits of a shorter hospital stay, quicker recovery, decreased blood loss during surgery, decreased pain and improved quality of life. In addition, patients experience less scarring and reduced incidence of infection. This is encouraging news to the thousands of women diagnosed with some form of gynecologic cancer annually. "Surgical robotics provides improved visualization, dexterity and precision over current conventional laparoscopy and expands the range of surgical options for many of our patients at Northwestern," says Lowe. "We are not advocating for an end to traditional procedures, as they will always remain viable options for combating this killer of women. We simply want women to be educated about all available treatments including minimally invasive surgery to fight this disease." "It's important that patients understand the options available to them, and that physicians be aware of surgical advancements such as the application of robotic surgery for gynecology malignancies so they can educate and refer patients for specialized care," says Lowe.